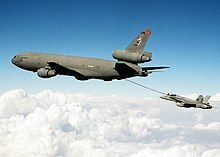 ^ "Boeing Wins CNS-ATM Upgrade Contract for USAF's KC-10 Tankers". Defenseindustrydaily.com. 2014-08-21. Retrieved 2017-03-16. 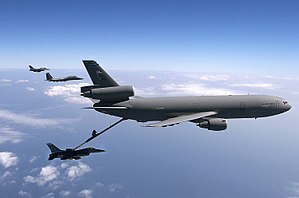 ^ "Rockwell Collins awarded contract for KC-10 CNS/ATM cockpit upgrade program". Retrieved 2019-01-16. ^ "380TH AIR EXPEDITIONARY WING > U.S. Air Forces Central Command > Fact Sheets". Afcent.af.mil. Retrieved 2019-01-16. ^ John Pike. "60th Air Mobility Wing [60th AMW]". Globalsecurity.org. Retrieved 2019-01-16. ^ "349th Air Mobility Wing History Facts > 349th Air Mobility Wing > Display". 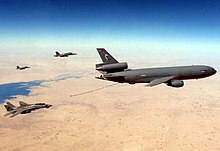 349amw.afrc.af.mil. Retrieved 2019-01-16. ^ "514th Air Mobility Wing". 514amw.afrc.af.mil. Retrieved 2019-01-16. ^ "How The Air Force's New KC-46 Tanker Could Become A Hundred-Year Franchise For Boeing". Forbes.com. Retrieved 2019-01-16.